Those that attended had positive feedback and thought they benefited from participating. Additionally, it was a great way to connect to others in the ad community and maybe learn a thing or two. On Tuesday night, there was a cocktail hour and awards ceremony honoring a few local advertising executives. The ceremony closed with Nancy Hill, the President/CEO of the 4A’s. She talked about Collaboration, Cooporation and Community. I thought that was a perfect topic for the audience. Since Media Works is a member of the 4A’s, I have had the opportunity to hear Nancy Hill speak a couple of times. She is really inspirational. And after listening to her, I have always felt reenergized and more passionate about my industry. I would highly recommend that if you have the chance to hear her speak, you should. In the past, CBS or CBSSports.com was the only place you could go to watch the March Madness Tournament. If the game you wanted to watch was not being broadcasted in your region, you were either stuck watching a one-seed blow out a 16-seed or you had to go online. This year it is different. For the first time ever, all games were broadcasted on either TNT, TBS, Tru or CBS. 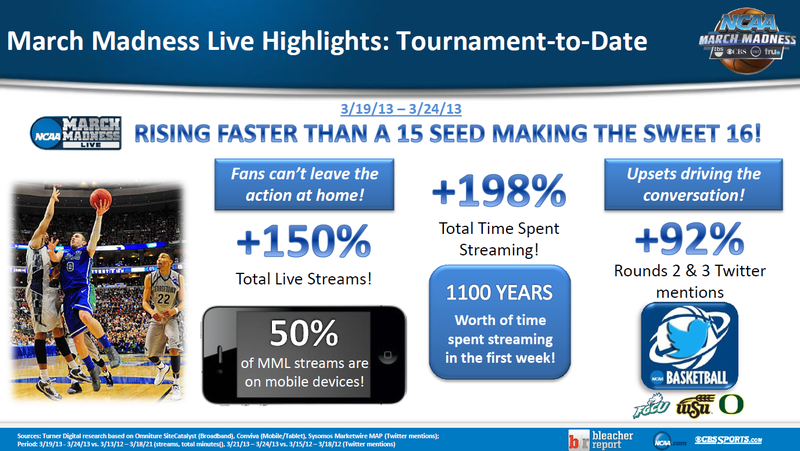 Most people did not even know what network they were watching, but in whole, broadcasting all the games increased overall viewership for the tournament so far. It was the best Thursday the tournament had seen in 20 years. Combined, the four networks averaged 7.828 million viewers, up 12% over last year’s 7.007 million. The average rating for the four networks is 5.9 which is 9% better than last year’s 5.4 for CBS. And while viewing is up, it has not impacted the online streaming program, March Madness on Demand, which had been put in place for people to watch all games up until this year. Additionally, visits to the site and mobile apps were up 22% over last year. All in all, it was a smart move for the NCAA to broadcast all games for the beginning of the tournament. Today, Mandy, Jennifer and I had the pleasure of attending the Jay Strongwater breakfast at Regalo to support braVo!. It was such a nice event. Creations from Jay Strongwater were beautifully displayed at tables based on the Jay’s collections. For instance, the table where we sat was called “Charming” as the center piece incorporated the charm jewelry collection. Another table was called “Meadow” and displayed that collection. A portion of all the proceeds from the items purchased at the event benefit the braVo! Financial Assistance Fund at Lifebridge Health. Established four years ago, this fund helps patients in need obtain services that are not covered by insurance such as breast prosthesis, wigs, transportations to and from treatments and utility bills. Media Works is happy we could help support such a great organization. On April 20th, Media Works helped Baltimore Washington Medical Center launch their Calypso – GPS for the Body media campaign. Calypso – GPS for the Body is a new technology that is used to treat prostate cancer. With an outpatient procedure, a GPS is implanted into the prostate, enabling the radiologist to pinpoint exactly where to provide the radiation. The media campaign consists of radio, newspaper, magazine, outdoor, online display and search engine marketing. All media is focused on the Baltimore market with some exposure in the Washington DC market, as well as the entire state. Research showed that while prostate cancer affects men, it is the women that make the health care decisions for the family. As a result, we concluded that the target demographic is Adults 35-64. To reach this target on radio, we utilized WCBM-AM, WBAL-AM, WPOC-FM, WLIF-FM, WWIN-FM and WZBA-FM. As for newspaper, we purchased ¼ page full color ads in the Baltimore Sun and ¼ page B/W ads in the Sunday Capital, Maryland Gazette and West County News. To compliment the print component, ½ page, full color ads in Baltimore Magazine, Chesapeake Life, Urbanite and What’s Up Annapolis were used. Outdoor will begin in May with bulletins rotating around I-95, I-83 and 295. Lastly, we employed online display and search engine marketing. Search will focus more on the treatments offered for prostate cancer. For online display, we used BaltimoreSun.com and WashingtonPost.com in addition to the ad network, Undertone. Display is targeted to Adults 35-64 in Maryland, as well as contextually targeted to the health channels and sections. We are really excited about the launch of this campaign. The switch from analog to digital signal is scheduled on February 17th. However, President-Elect Obama has called for a delay which would postpone the switch until June. The reasoning behind this recommendation is that too many Americans are still relying on the analog signal. The Nielsen Co. estimates that 7.8 million TV homes are totally unprepared for the switch. Additionally, the federal program that subsidized the converter box has hit its funding limit. Therefore, there are no more $40 coupons left. This leaves the burden of the full cost of the converter box on the viewer. Many argue that this is unfair, given the state of the economy. While this delay may help viewers, it could be costly to television stations. Many stations have been educating their viewers of the switch for months now, running countless Public Service Announcements. This switch is no longer news. If there are viewers that procrastinate now, they will most likely procrastinate even at the later date.